So before I went vegan I was obsessed with the non-vegan version of these that I would buy at Trader Joe’s. Recently I was longing to eat something like it again, but wanted it to be vegan of course. 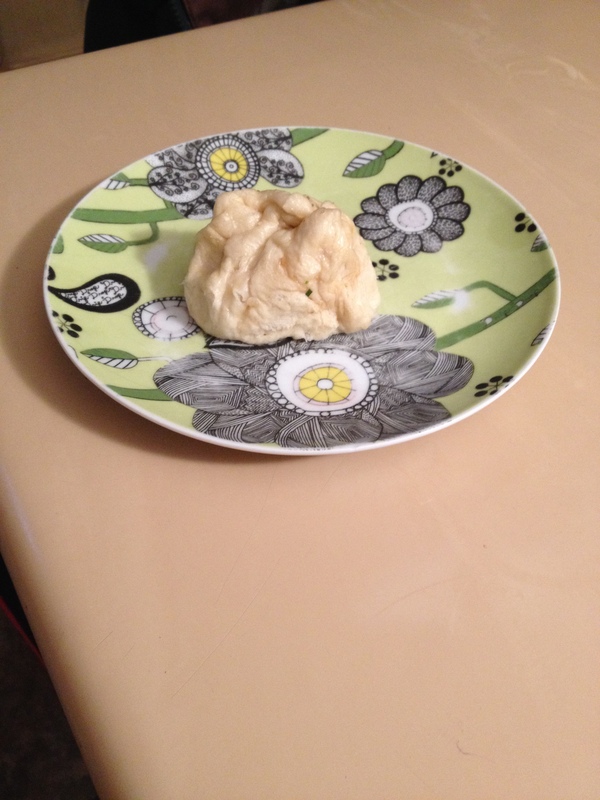 I did not want to attempt on my own to create a recipe for the Chinese Bao (steamed bun) dough myself, as I have never tried to make these before…so I referenced this recipe for that. I also had found the perfect vegan “shrimp” seitan recipe online long ago, so I decided to make that instead of coming up with something entirely original. The part that was all my own was how I cooked the shrimp seitan to fill the bao with. Also, I recommend a using a large steamer if you want to make this recipe. If you do not have one, I do not know what to recommend in order for them to come out right. I imagined trying to steam on the stove in a saucepan sized steamer, all 24 bao, and it just seemed impossible. Luckily, I remembered that I had found an electric steamer for free from the Providence Really, Really Free Market awhile ago (that I had never used since picking it up, of course, haha) and used that and it worked smashingly well. 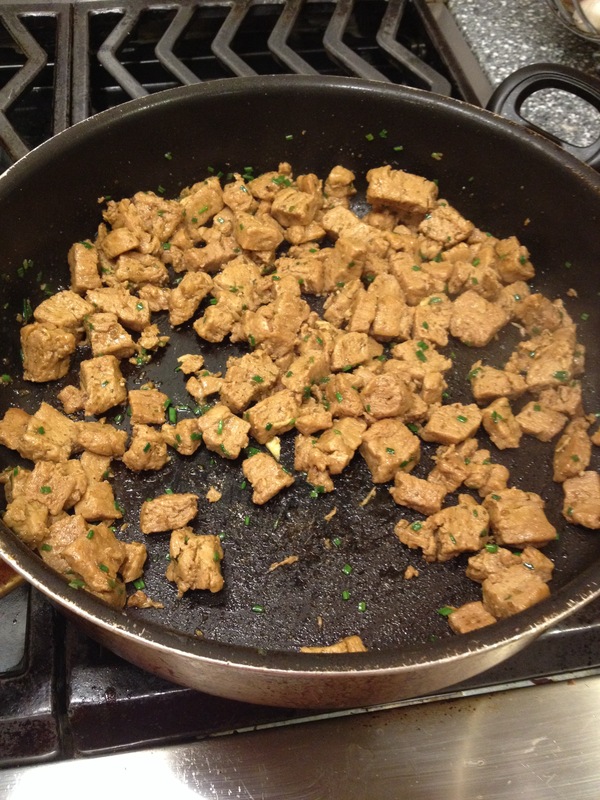 I made the recipe for the “shrimp” seitan the night before. I had baked some sweet potatoes and just pureed them with a small amount of water in the food processor beforehand. Also, because it’s slightly unclear, the “gluten flour” they reference is actually vital wheat gluten flour. I used kelp granules instead of dulse. Heat olive oil in a saute pan. Add garlic and ginger stir in the oil until fragrant. Then get back to the bun recipe. I did not follow the recipe exactly as it said. I basically did not care about making them super pretty, so I did not roll out the dough I had sectioned into 24 pieces. 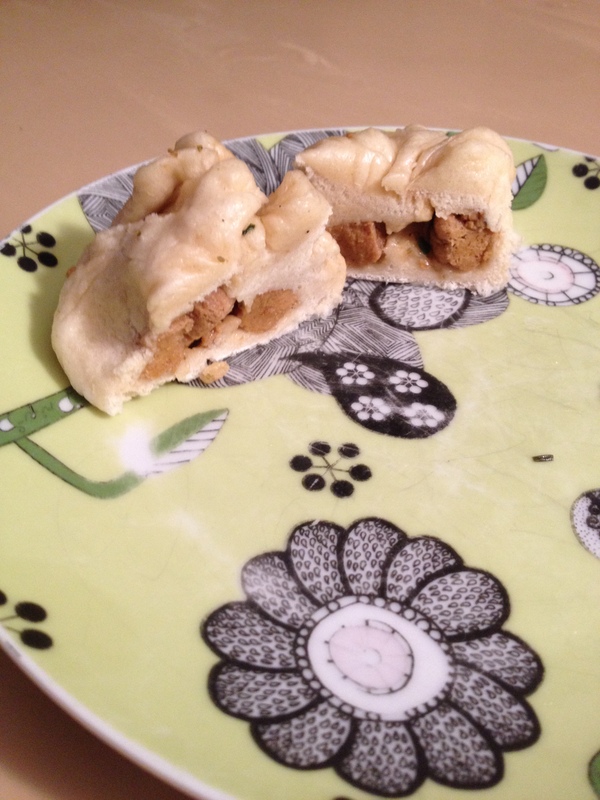 I just smooshed them down with my hands, worked them into a circle with my fingers, placed a small amount of the shrimp filling inside, and then pinched the dough closed around the filling. Then resumed the rest of the recipe’s instructions. I used two layers in my steamer, and the first layer that was closest to the steam was done probably in 15-20 minutes. I took that basket out, so it would stop cooking, and moved the top one down. That took another 15 minutes at least. You just want them to start looking less like dough, and more like a very soft bread. That’s it, enjoy them! I wish I could have figured out a way for them to have more sauce in them, but I think it would have been too difficult to pull off when steaming them, anyhow. Overall, quite yummy! Hi – Natalie pointed me your way when I asked her if she had any vegan “seafood” recipes I could include in a round up. Would it be ok with you if I used your photo with credit and linked back here for the recipe. It’s for my weekly vegan column at Key Ingredient’s blog. hey! yes that’d be rad! I love people sharing my blog around 🙂 Can you comment here with the link when you post it? I’d love to see it. It will be up tomorrow t http://www.keyingredient.com/blog/?p=15338308473 – thank you for letting me use the photo!